Rich in calcium to help build strong bones and teeth, Nesquik has helped generations of kids to enjoy milk by making it taste delicious. Why not also try Chocolate and Banana flavour? No added colours, artificial flavours, sweeteners or preservatives.Chocolate flavour mix with added vitamins and minerals for milk. 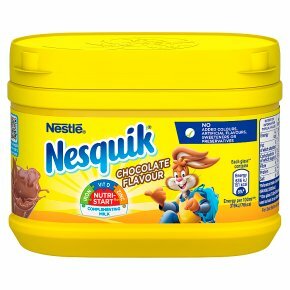 NUTRI-START Enjoy Nesquik® as part of a healthy, family breakfast and balanced diet and lifestyle. Vitamin C & Thiamin help the nervous system to function. Vitamin D, calcium# and phosphorus# are needed for normal growth and development of bones. Iron & Zinc help cognitive functions such as memory and concentration. #from semi skimmed milk.